I WAS EXPECTING THAT I'll be celebrating tonight after finishing the last leg of our practical exam (Surgery) for the Veterinary Practice Fundamentals A this morning. But I have been stressing out, instead, because I had screwed up a station at the Anaesthesia component yesterday and another station at the Surgery component this morning. It really pays to browse the entire page and read all the sentences on the exam sheet before loosening up a bit on a station. I can still see myself moving to another exam station and eventually realized that I had missed a bunch of questions in the preceeding one after spending half of my time 'taking a nap' there! I could only wish that our senior lecturer in Anaesthesiology or the exam station facilitator would consider that failing to write it on my paper doesn't necessarily mean that I don't know how to trace the fresh gas flow in the anaesthesia machine. But yeah, that's not how this final practical test goes. 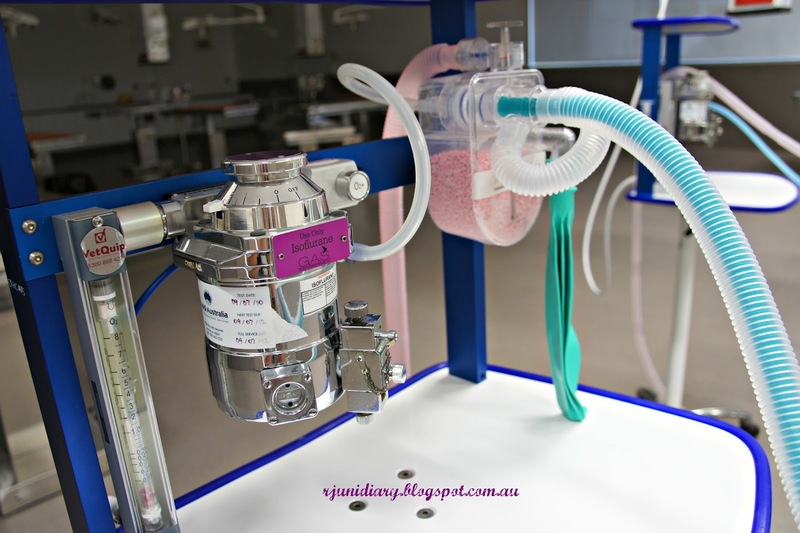 The anaesthesia machine- Rebreathing System. My classmates who did the Surgery bit of the prac exam ahead of our group were saying that that was the easiest of the three components (the Diagnostic Imaging element was the most challenging); but I still burnt loads of midnight candles- stitching, familiarizing myself with my notes and the things we basically did in the practical sessions. 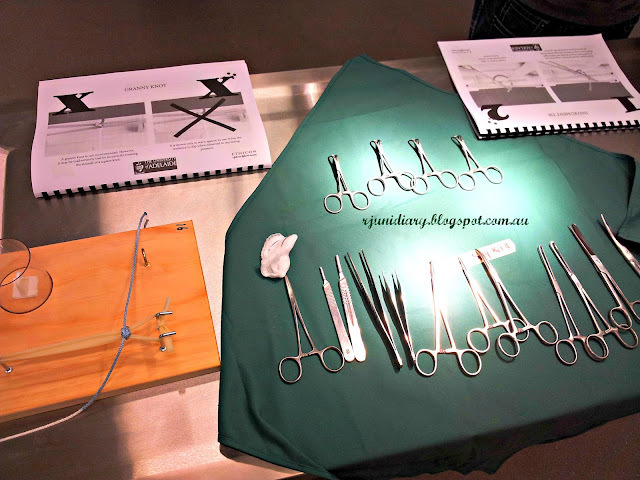 Our Surgery prac exam was scheduled earlier this morning and I believe I did well in the suturing station, etc... but in the final station, where I was asked to apply a light compression bandage in an 11-minute time frame, I just simply messed it all up! I was surprised to find a giant dog cadaver (sorry I failed to identify its breed) lying on the surgical table when I entered the room. I was panicking because didn't expect that I would need to make a bandage doughnut that would snuggly fit around those exceptionally huge paw pads; I'm not good at these surgical doughnuts and I felt that I was just unprepared to do it. Well, I did manage to make two bandage doughnuts but those weren't pretty enough; I started to worry until I heard the bell ringing- a reminder that I only have three minutes left to finish my task. I knew I was in trouble because I hadn't even started with the first layer yet! In short- I didn't make it in the final station. Is bandaging skills a measure of being a good surgeon? It's been a very long day and I can feel that I need a soothing massage while waiting for the exam marks. With all these stressors, I have still gained 6.6 lbs since February. I have started to eat a little lesser and healthier for three days now, hoping that this food restriction will do more good things for me. Student's blues. Cramp for the exam and edgy on your anticipated test score.